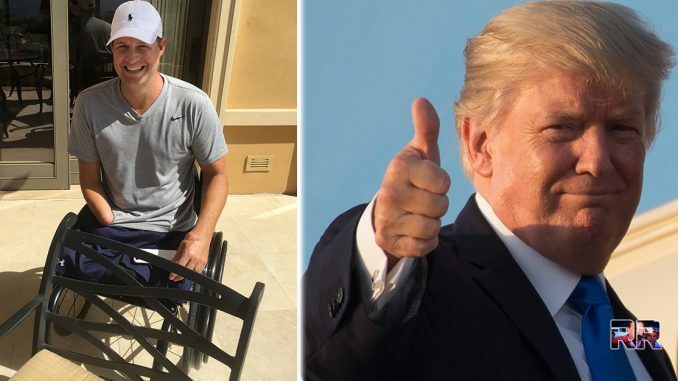 Triple-amputee vet Brian Kolfage started raising money to build President Trump’s wall on Monday. 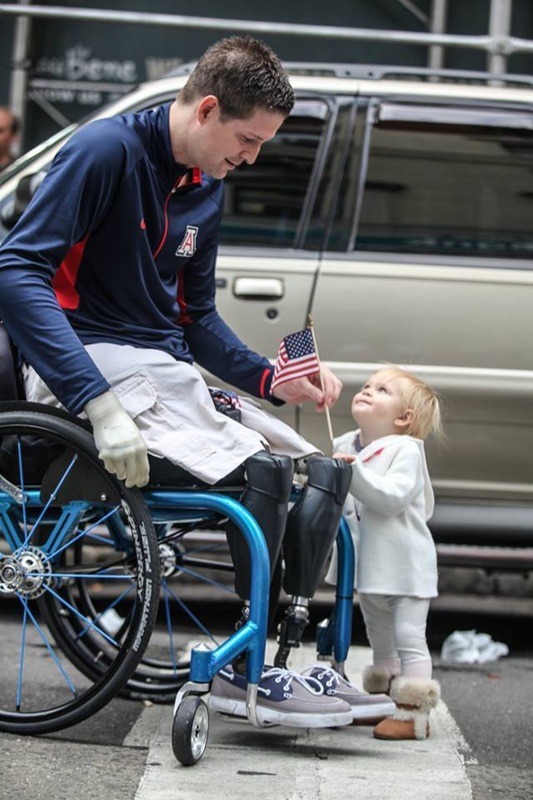 In three short days, at the time of this writing, Airman Kolfage had raised over $7 million. As of Thursday night, $10 million had been contributed to the wall fund. 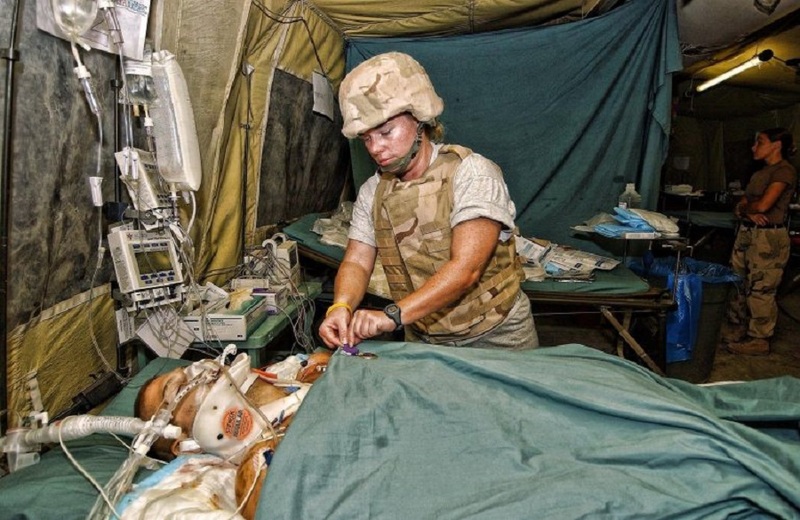 It’s a stunning feat to raise that much money in that short amount of time, but Americans want the wall, and the triple-amputee vet saw a way to get it built despite congressional Democrats blocking every effort to begin wholesale construction. Now that Brian’s effort has gone viral, even the “enemy” is helping out. Brian joined the Air Force after almost 3000 Americans were killed in the September 11, 2001 terror attacks that also destroyed the Twin Towers in New York City. He wanted to keep what had happened to thousands of his fellow Americans from happening again. It was his duty, he believed. 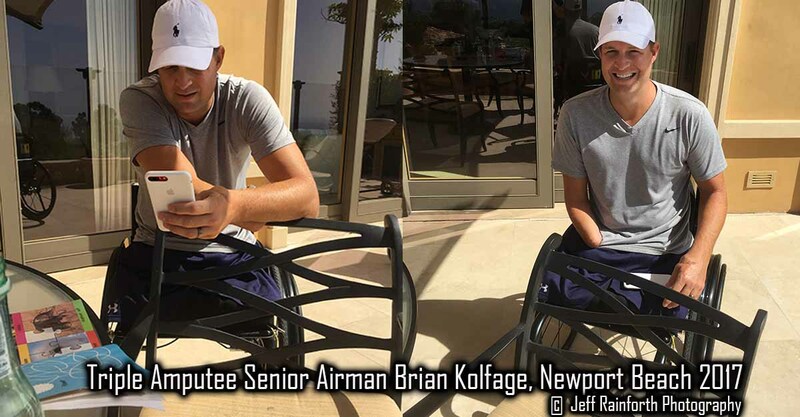 On September 11th, 2004, exactly 3 years to the day since the 9/11/01 attacks, a 107 mm rocket landed feet from Airman Kolfage. He lost both of his legs just below the hip and his right hand. 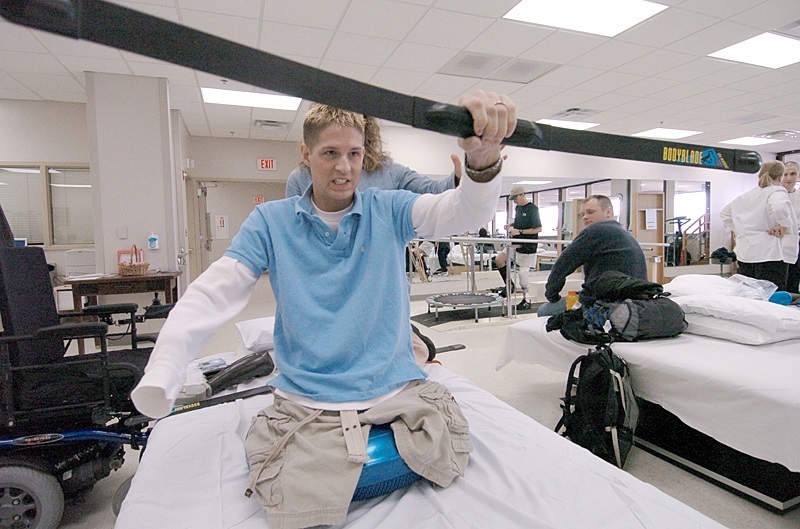 Doctors didn’t expect him to live or walk again, but he did. After graduating from college as an architect, Kolfage became interested in news publishing and began managing pages on Facebook for news websites. He also started his own coffee company, Military Grade Coffee. 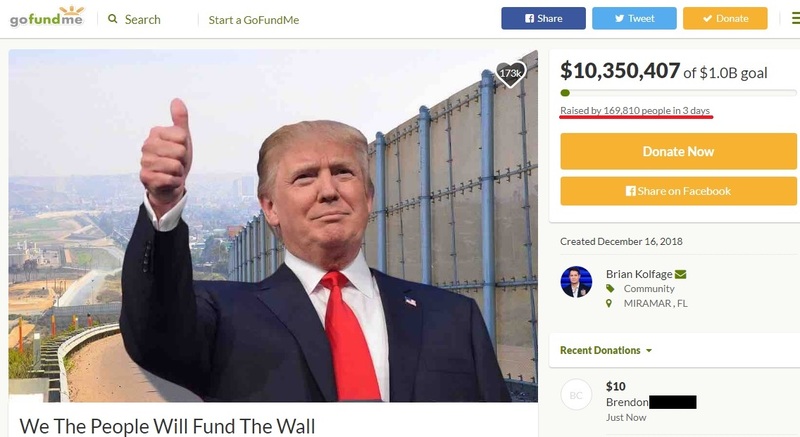 Despite having all that going on, Airman Kolfage started raising money to build Trump’s wall. Kolfage literally began fundraising to build the wall on Monday, and in a few hours had raised over $22,000. On Tuesday, over $300,000 had been raised. On Wednesday, over $2 million had been contributed, and by Thursday afternoon, the fund was at $7 million. Thursday night, $10 million had been raised for the wall as word spread of the wounded veteran’s effort. Now even “fake news media,” the “true enemy of the people” as President Trump calls them, are jumping on board to cover Airman Kolfage’s efforts. 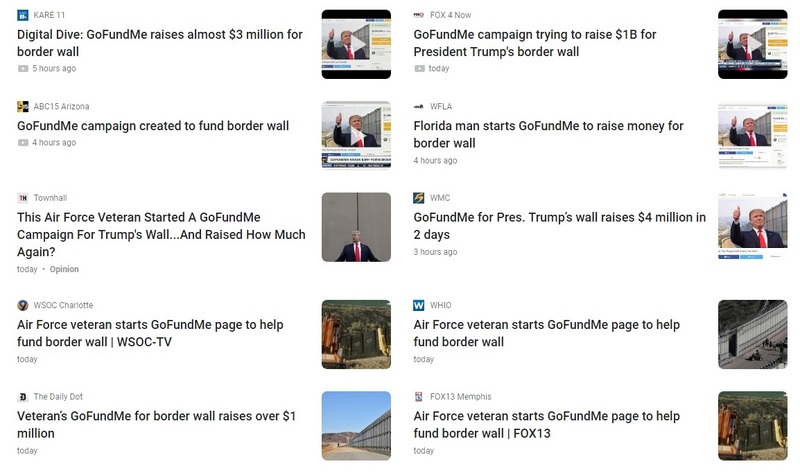 Airman Kolfage sent me a text this morning with an update saying that “GoFundMe Border Wall” was the number one search trend on Google. He also said that CBS News is coming to his home and that even CNN had been in touch for an interview. ABC News also did a short story via the Associated Press. The article sticks to the facts & is not negative. Surprisingly, even the Washington Post did a story. I asked Kolfage if the WaPo story was “positive or negative,” to which he replied, “neutral.” That’s a good thing. Normally, WaPo’s coverage of anything having to do with President Trump is negative. Below is a screenshot of WaPo’s story. The only thing really wrong with WaPo’s story is the number of days it took to raise the money. WaPo says 4, while GoFundMe says it was three days. Here’s a screenshot. 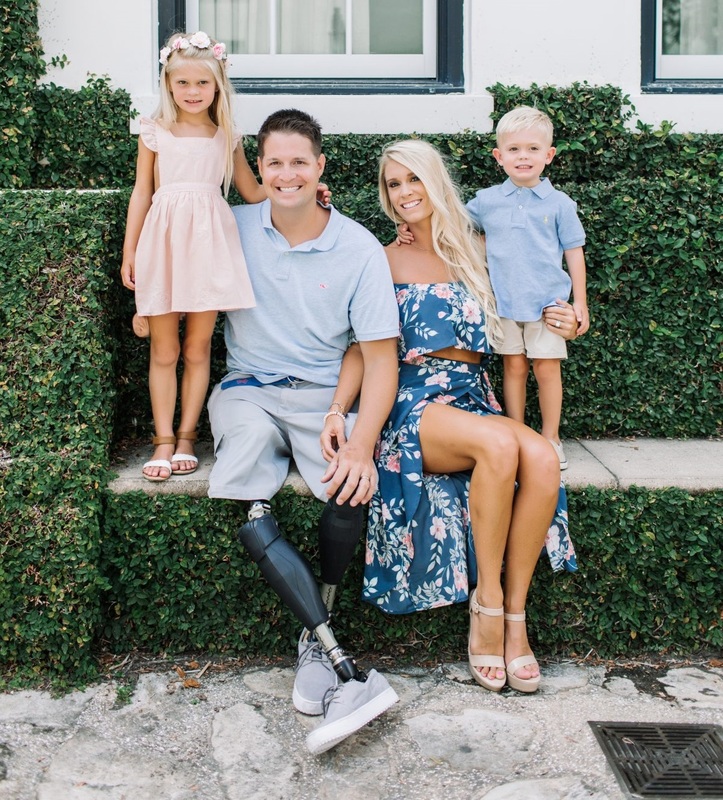 DON’T STOP SHARING THIS UNTIL AIRMAN KOLFAGE REACHES HIS GOAL!! Fox News has been in touch with Kolfage, which is expected. Fox covered the story of Facebook taking down Brian’s political news & coffee pages prior to the midterm elections. A Google search of “Brian Kolfage” shows that news outlets nationwide have now picked up the story. We have contacted the Trump Administration to secure a point of contact where all the funds will go upon completion. When we get this information secured we will update. We have many very high level contacts already helping. Airman Kolfage ran the Right Wing News (RWN) Facebook page this year & had been involved with the brand for several years. Kolfage invested $315,000 to grow RWN and other brands on Facebook. Then, right before the midterm elections, Zuckerberg & Facebook decided they couldn’t allow Brian’s popular, conservative RWN page & several others Brian managed to continue to exist. They shut down all of his pages, including his coffee company, robbing him of the $315,000 he had invested in them so he could provide for his family. Kolfage then started an organization to fight for free speech and will be suing Zuckerberg & Facebook soon. It’s a major deal that mainstream media is covering Airman Kolfage’s efforts to get the wall built. Normally they wouldn’t publish anything of the sort, and if they did, it would be negative. So far, except for a few far-left news sites, the coverage has been neutral if not positive, as journalism should be. I worked with Airman Kolfage for 3 years as his editor-in-chief until Facebook shut his pages down in October. I was friends with him for years before that, and I can honestly say, if anyone can get this done, it’s him. He has overcome so much, yet he never quits, no matter what. He doesn’t know how to fail. He will accomplish this mission. Let’s help Brian get the wall built! Follow Jeff on Facebook HERE.